A compliment to its core menu, which changes twice each year (Spring/ Summer and Fall/Winter), “The Fresh Sheet” menu will change weekly based on fresh fish available from local markets (and will be posted to Rizzuto’s Facebook page). 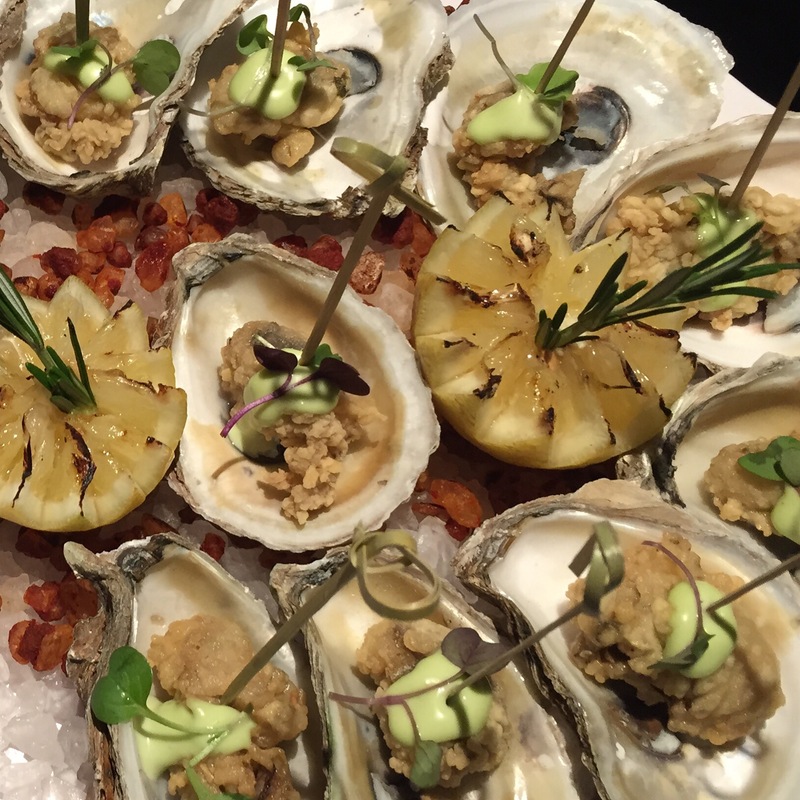 The raw seafood bar and fresh seafood dishes on “The Fresh Sheet” each week are the creative collaboration of Rizzuto’s Executive Chef Mariano Flores and General Manager Mark Turocy. You can expect 5-6 varieties of daily fish selections alongside the raw bar such as mussels, clams, calamari, branzino, mahi mahi, sea scallops, and Bluepoint Oysters. I had the pleasure of experiencing “The Fresh Sheet” this week and seeing how Rizzuto’s is adding New England style seafood to their repertoire. Don’t forget Rizzuto’s is still an Italian restaurant at heart (my goodness, how I love Italians and their food!). Are you ready seafood lovers? We began cocktail hour with hand passed fried oysters, mini crab cakes, and mixed berry sangria. The Fried Oysters are Bluepoint oysters coated in panko, fried, and served with a citrus wasabi aioli with grilled lemon. 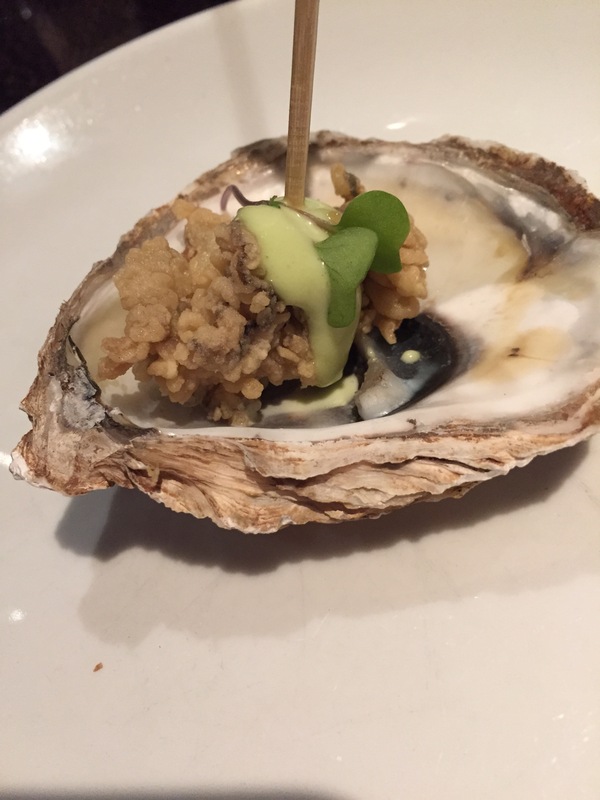 The panko is light and adds a little crunch to the chewy oysters while the wasabi adds the slightest kicks and pairs perfectly with the citrus. 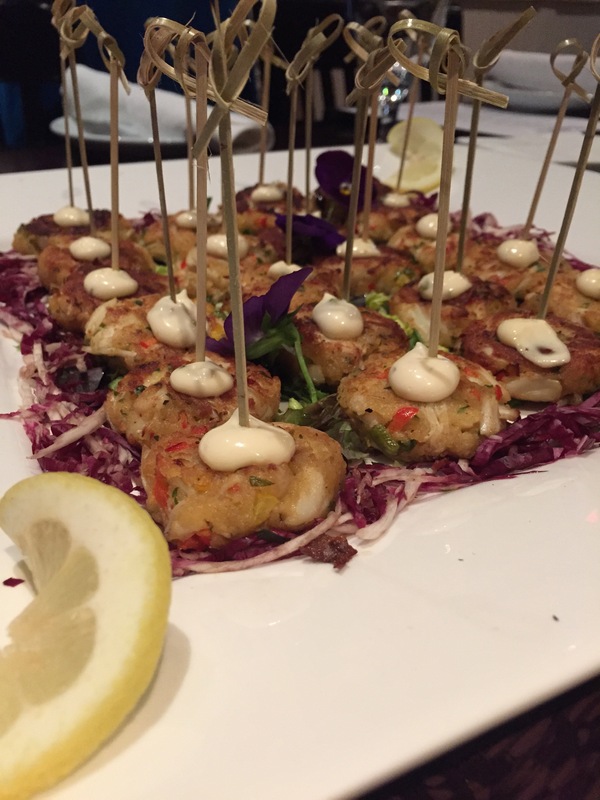 The Mini Crabcakes were packed with flavor from the crab meat itself to the finely diced red and green peppers inside to the spicy remalade sauce dolled on top. 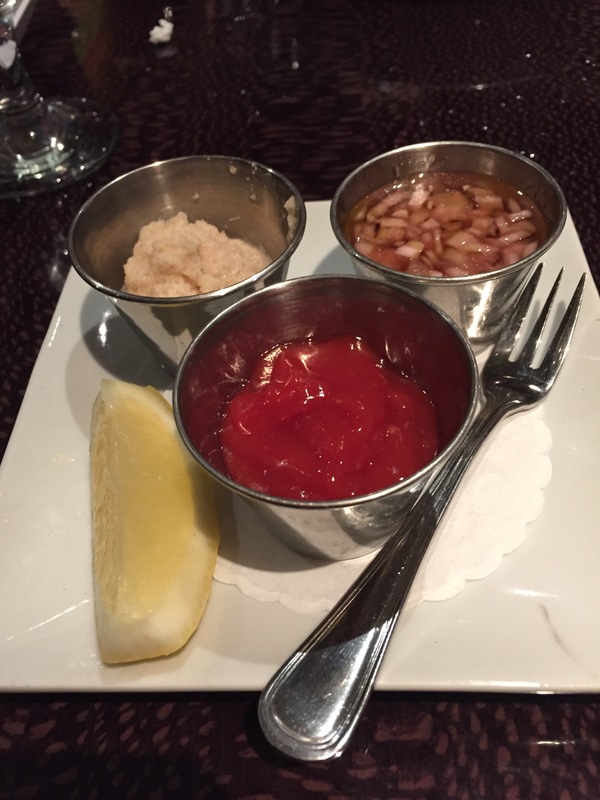 It was hard to not keep eating both of these dishes, but I had to pace myself – there were nine courses, don’t forget. Cocktail hour was complimented by a house made Mixed Berry Sangria of muddled strawberries, blueberries, and raspberries. 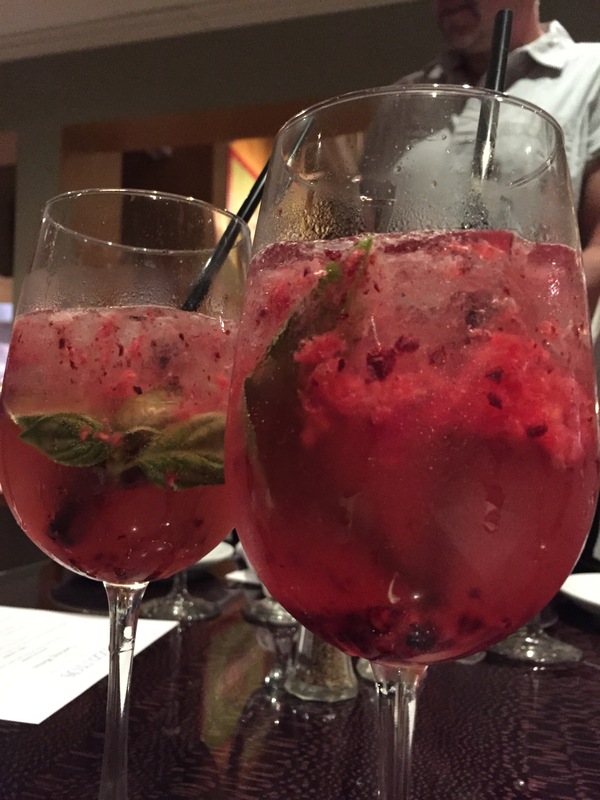 Sangria is one of my favorite summer cocktails and this one is simple yet delicious and you can taste the berries. 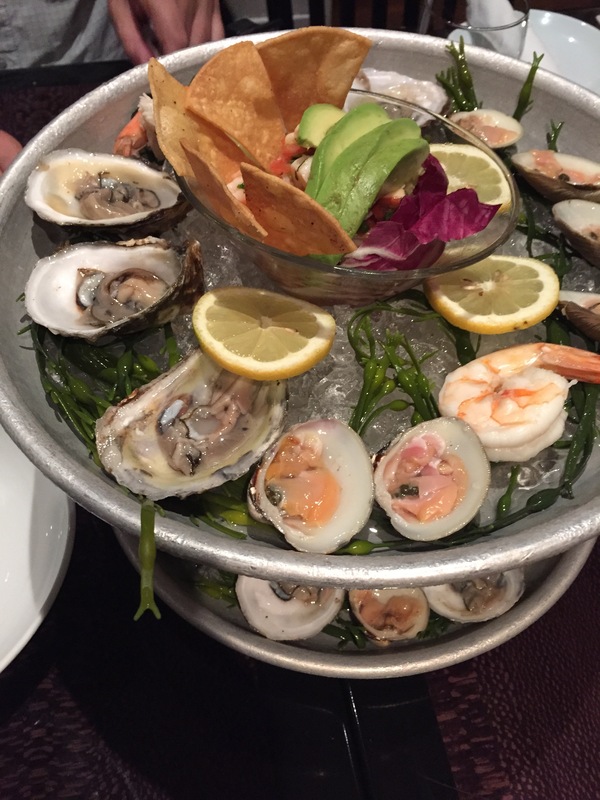 The next course was the Raw Bar Seafood Tower comprised of Bluepoint Oysters from local Cobb’s Island Oyster, Co., Little Neck Clams, Wild Pacific jumbo shrimp, and fresh Shrimp Ceviche. The Ceviche is made with shrimp, cilantro, a little jalapeno, and lime juice. Citrus always pairs well with seafood, and our drink recommendation of Magic Hat Electric Peel beer (not pictured) further played up this flavor pairing offering a light beer to go along well with the brininess of the raw bar. 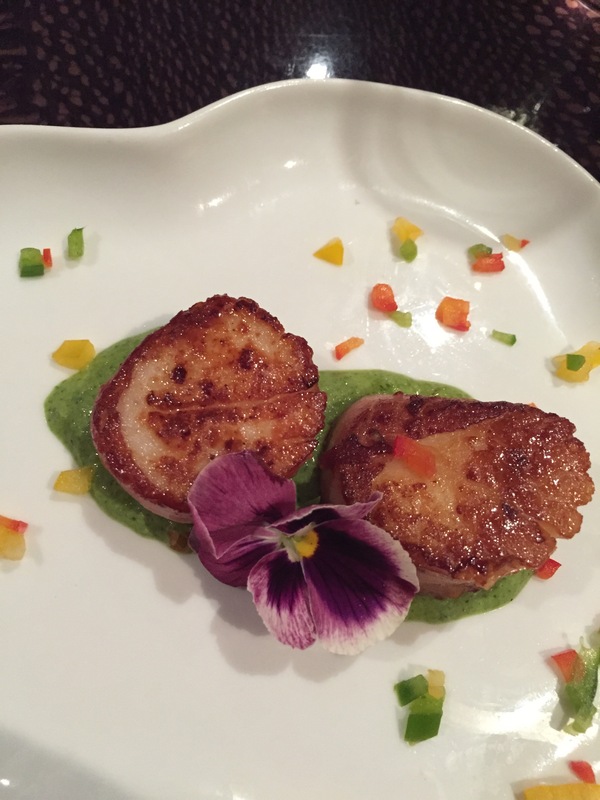 Our next course was the Speck Wrapped Scallops paired with Vermentino, Sella & Mosca “La Cala” wine from the coastline in Sardinia showcases the slightly sweet scallops wrapped and seared in panchetta or speck, plated on top of a green pea purée, and sprinkled with bell pepper confetti. Fourth course, and almost halfway through this glorious meal, was the Spicy Housemade Squid Ink Fettuccine with Shrimp. Topped with Andouille Sausage (not made in house), extra virgin olive oil, garlic, red pepper flakes, green bell peppers, and cherry tomatoes and paired with a Pinot Grigio/Sauvignon Blanc, Bertani “Due Uve,” the Spicy Squid Ink Fettuccine is excellent. 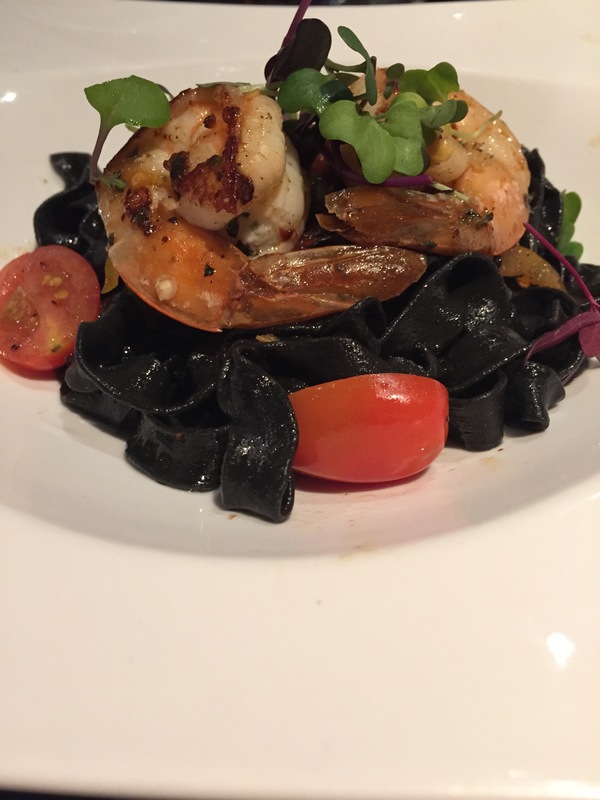 You can expect a slight flavor from the squid ink, but mostly you will taste the shrimp and the spicy andouille sausage which has a nice kick to it! 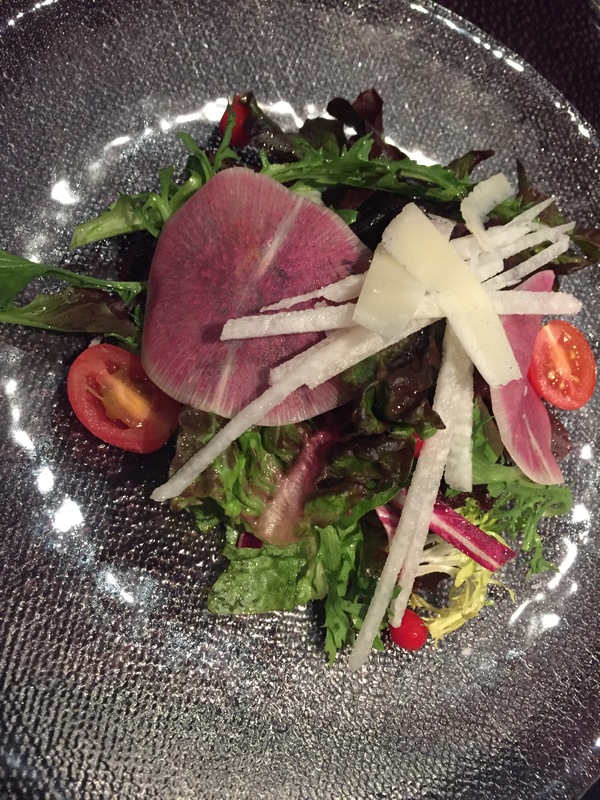 Organic mixed greens, watermelon radish, jicama, Peruvian sweet teardrop peppers (they look like small red berries), cherry tomatoes, shaved pecorino, drizzled with a balsamic vinaigrette comprise the Organic Mixed Green Salad at Rizzuto’s. What’s makes this salad stand apart from any other mixed green salad you might find? The unexpected ingredients you will not typically find in a mixed green salad such as the watermelon radish, jicama, and the beautiful and surprisingly sweet Peruvian teardrop pepper make this salad unique. 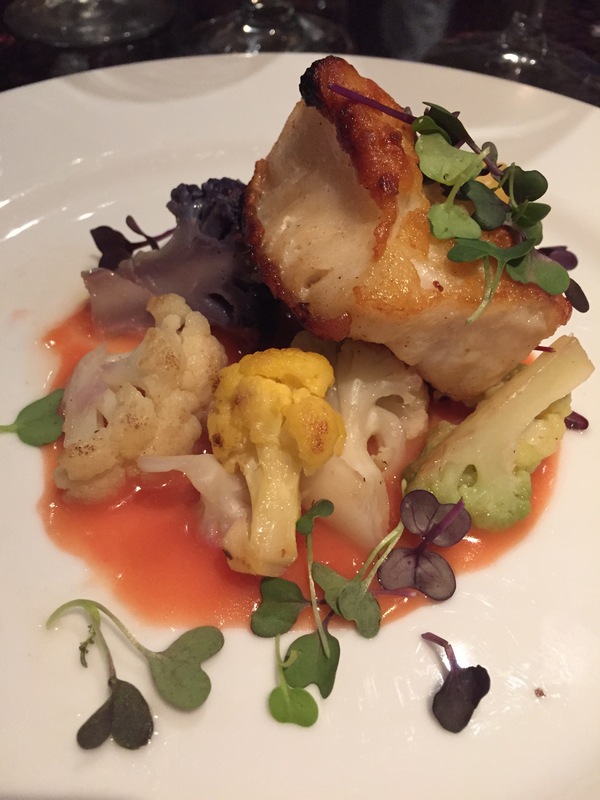 Chilean Seabass with Tri-colored Cauliflower served in a Blood Orange Cream Sauce was served next and it was so delicious our entire group went silent; you could hear a pin drop as everyone focused on this dish. The freshness of the cauliflower along with that flaky seabass with the skin-side seared so it was crispy was even further enhanced by the slightly citrus flavor of the blood orange cream sauce. 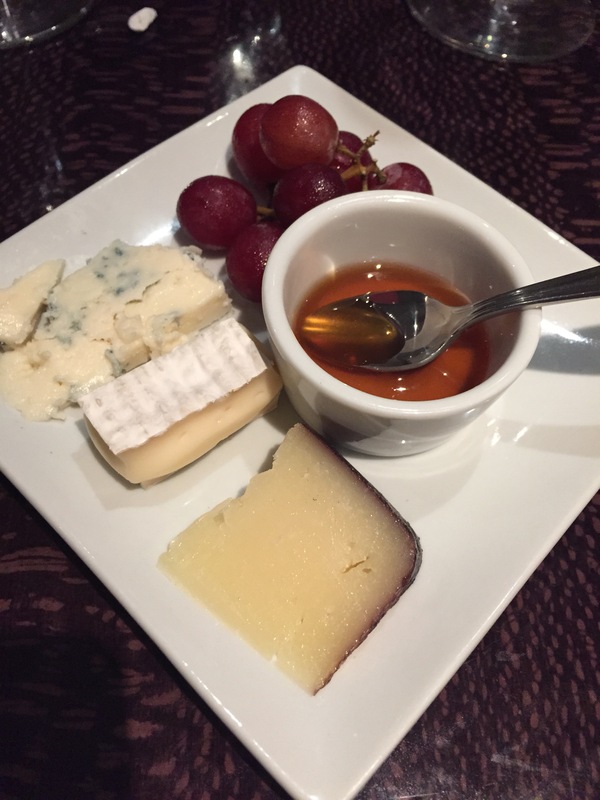 I should also add that the portion we received for our tasting is smaller than the typical dinner portion of eight ounces. This course was paired with the Consenso Rosato, Saladini Pilastri from the spits Adriatic coast made from organic grapes with a slight strawberry flavor to it. 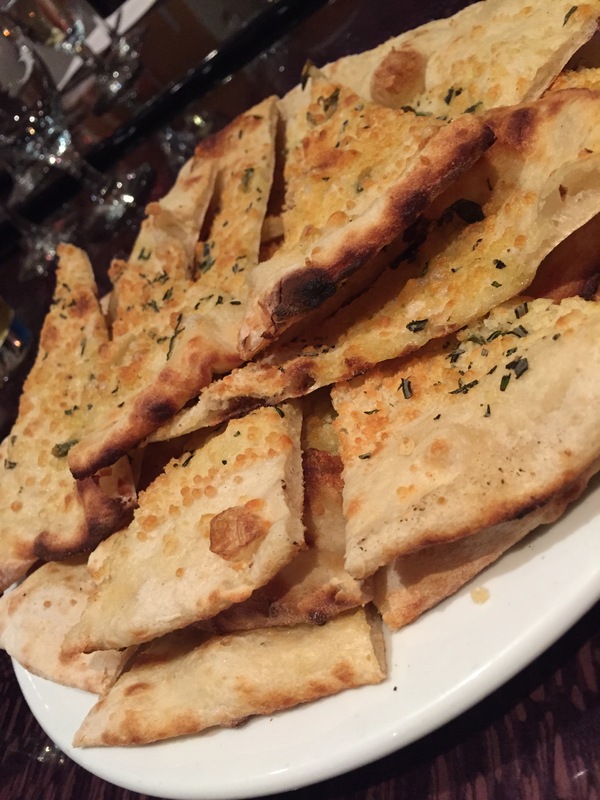 In between these two courses new tried the bread which is served at all Rizzuto’s locations made from their pizza dough and topped with Pecorino Romano and garlic; it’s perfectly cheesy and chewy. Rizutto’s famous Lobster Macaroni and Cheese with Ribeye Steak was our seventh course paired with Super Tuscan, Re Di Renier from Tuscany. 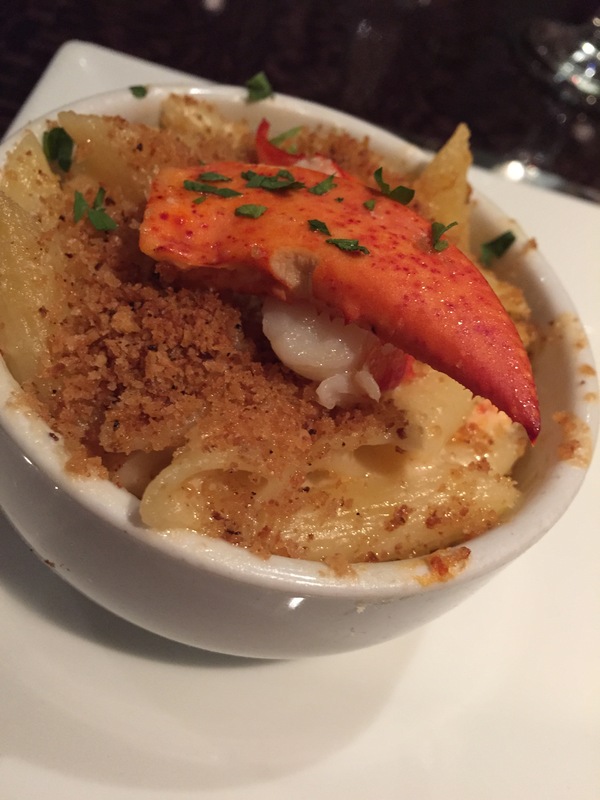 One bite of the Lobster Macaroni and Cheese is all you need to know why Rizzuto’s is known for this dish. Made with Parmesan cheese, pecorino, and cream, the lobster meat is mixed inside and panko and lobster claw are added on top. 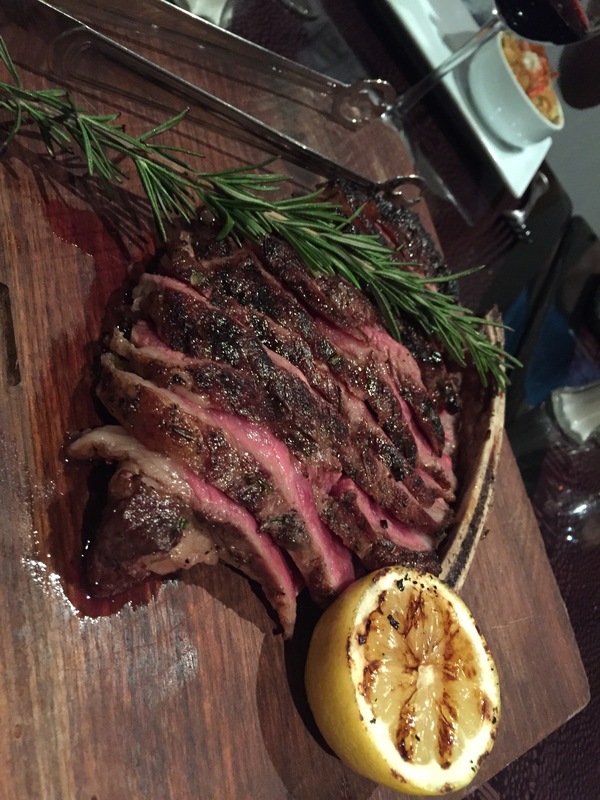 Paired with the Ribeye Steak, these two dishes make a great surf and turf option. Our second to last course was a Cheese Course made up of seedless grapes, Maytag Blue Cheese (cow cheese) from Iowa (far left), Melinda May from Mystic Cheese Company in Mystic, Connecticut (made from cow milk in the summer and goat cheese in the winter), a fifteen year Pecorino Brio de Vino from Italy (right; this sheep cheese is aged in terra cotta vases with wine), and honey from Red Bee Apiary in Wilton, Connecticut. And last, but not least, our final course – dessert! 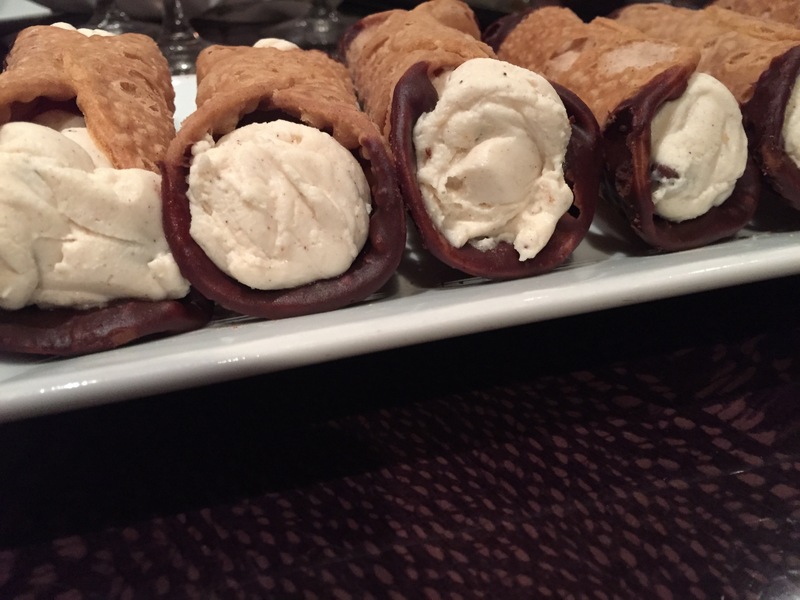 House made cannolis, a friendly reminder of Rizzuto’s Italian menu, and the unique adult root beer floats finished up this memorable meal at Rizzuto’s. Small Town Brewery makes this sinfully delicious beer that tastes just like root beer soda called Not Your Father’s Root Beer. It’s only recently become available in Connecticut and I was able to try it recently, however this is the first time I have tried it as a float! 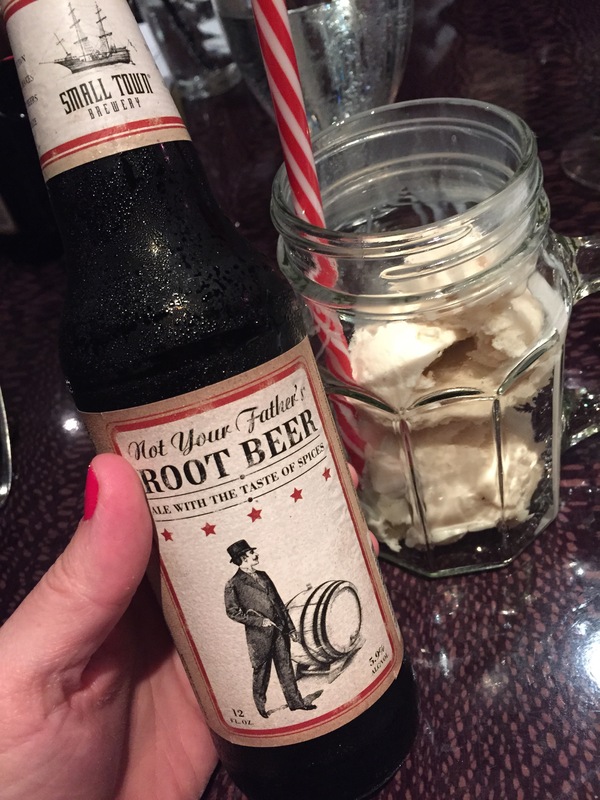 If you didn’t know it was Not Your Father’s Rootbeer you might easily mistake it for a Rootbeer soda. This special treat was thought up by General Manager Mark Turocy and I am so grateful he did! 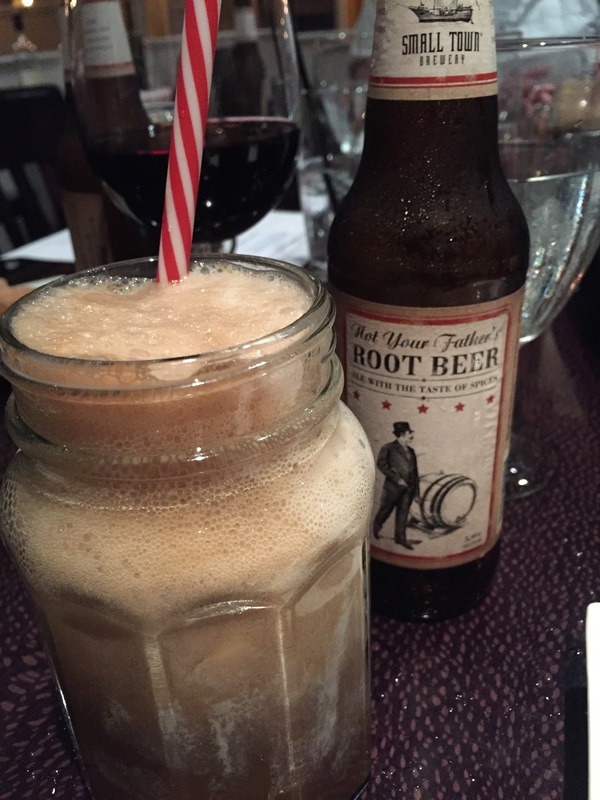 This wasn’t just vanilla ice cream in our floats, this was Vanilla Bourbon Gelato with 5.9% Not Your Father’s Root Beer poured over the top and the striped straws made it even more fun! Rizzuto’s new “The Fresh Sheet” seafood menu is impressive offering fresh and locally sourced fish and raw bar options weekly, and even more importantly it has new and exciting changes while still staying true to what Rizzuto’s does best – great food and hospitality. Don’t forget to check out the weekly “The Fresh Sheet” on Rizzuto’s Facebook page!